Beds with tons of white linens are so heavenly to me. There’s something great about jumping into a fully white bed with a puffy comforter and luxuriously soft sheets that makes you feel like you’re soaring on a cloud. It’s restful, and feels like you’re staying at a five star resort. I made sure when I moved into my new place that the bed was the one place I invested some money. 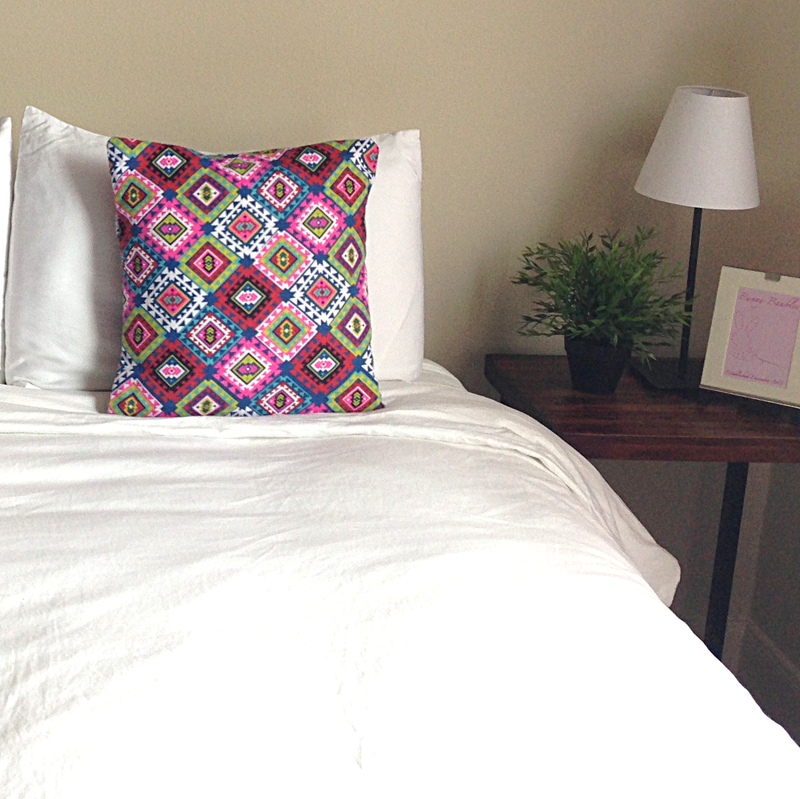 I was left with a dreamy sleeping zone… yet somehow it wasn’t very me. I really like clean white…but I LOVE color. So BAM! 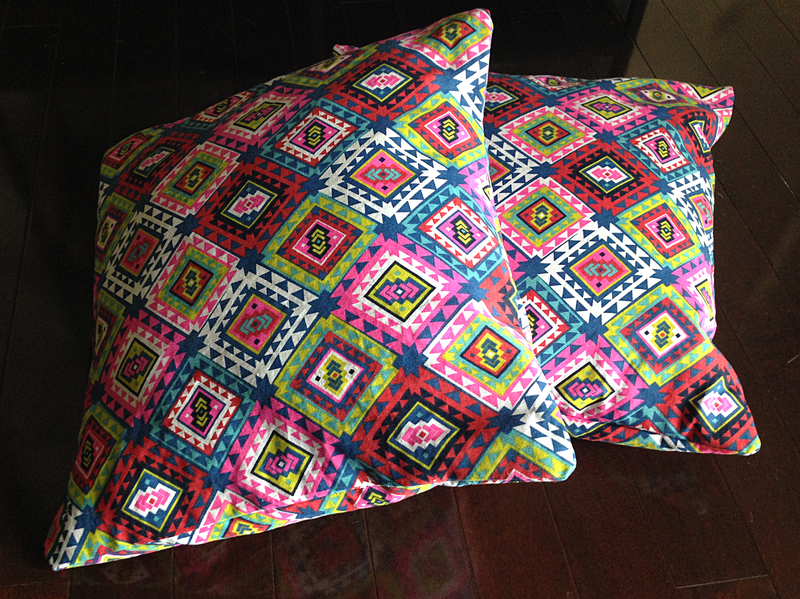 I bought this ridiculous fabric at JoAnn Fabrics to make some fabulous throw pillows! 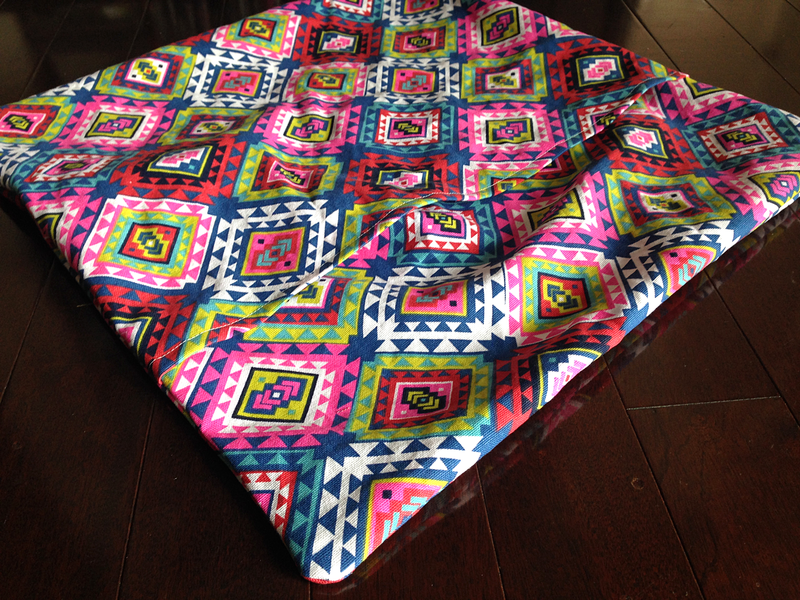 I love the colors and the pattern is fun and tribal-esque. Sort of Fall-ish with the happiness of Summer, no? But is it too much? Maybe? But that’s why I made it into some removable pillowcases, so I can take them off if I get tired of them and replace them with new fantastic fabric! 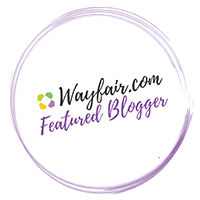 People, do NOT spend money on expensive throw pillows! 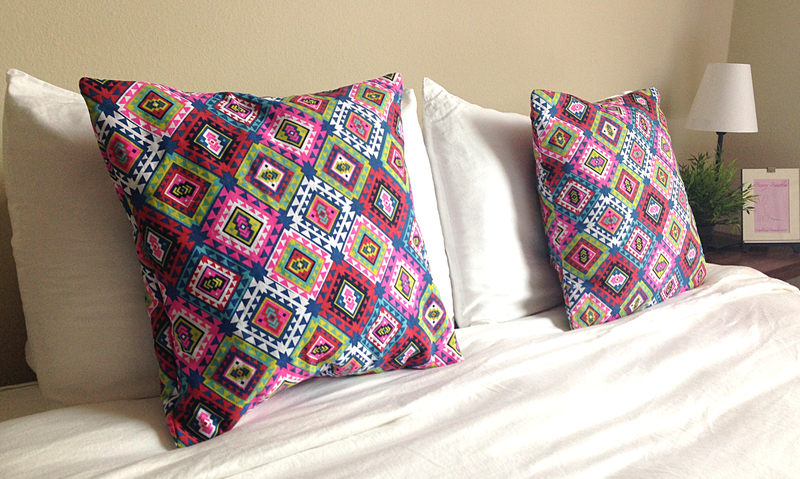 Find a cheap, simple pillow, even an ugly one on sale, and you can totally redo it! 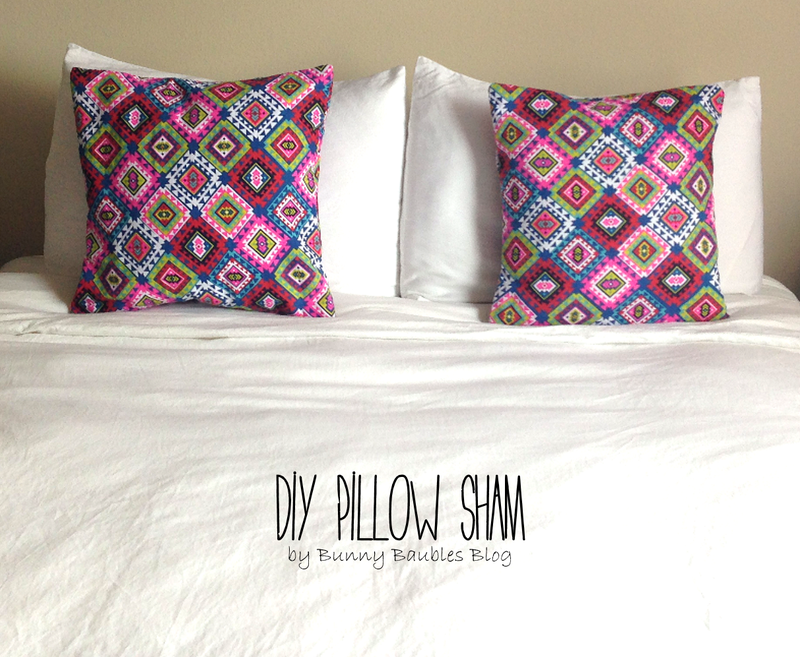 Making this Simple DIY Pillowcase is seriously the easiest sewing project I could teach you. So let’s get to decorating, shall we!? 1. Wash and dry your fabric. If you don’t do this, you will have fold marks in the fabric and it will shrink strangely the next time your try to wash your pillowcase! 3. Take pieces 2 and 3 and fold and pin one of the edges down on the side that is the length of the pillow about 1/2″ (from example, fold 13″ side down 1/2″ so width side is now 12 1/2″ long). Thread your sewing machine and sew a straight stitch along this edge about 1/4″ from the bottom of the fold. 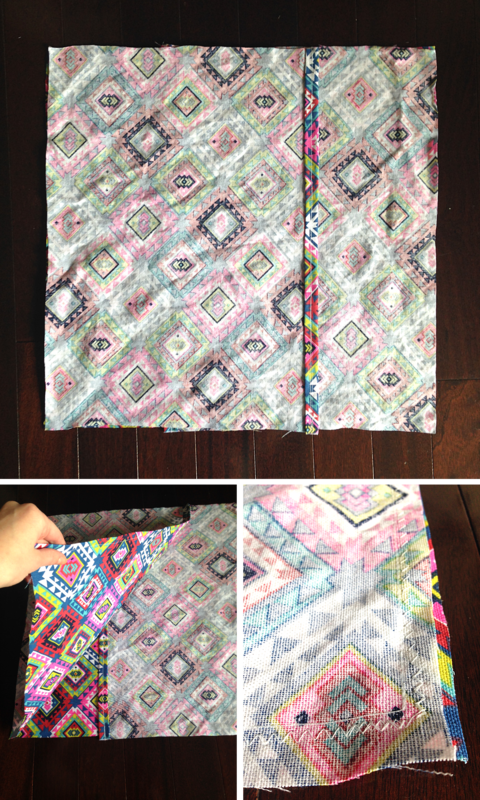 Now fold that same side over 1/2″ and sew about 1/4″ from the bottom of the fold. Do for both pieces. 4. Lay out piece 1 nice side facing up. Now lay down piece 2 nice side down to line up the rough edges to one side of piece 1. Lay piece 3 nice side down to line up the rough edges with the other rough edge side of piece 1. You should have pieces 2 and 3 overlapping in the middle of the pillowcase with the nice edges in the middle. Pin around the edge of the pillowcase. 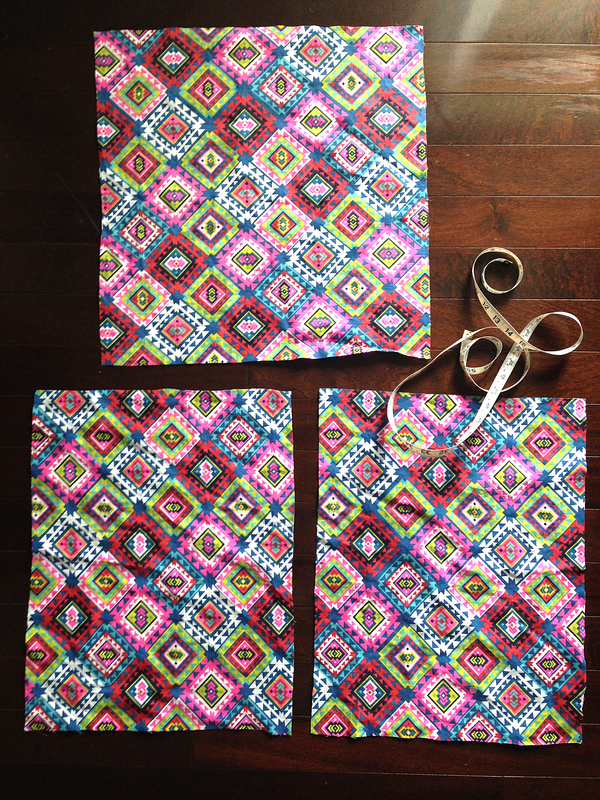 Sew a strait stitch about 1/2″ away from the edge of the entire pillowcase. Then go back and sew a zig-zag stitch closer to the edge all the way around the pillowcase to get a secure finish. 5. Turn your pillow case right side out, slip your pillow in and throw it on the bed! You’re done! Doesn’t this just look like the happiest place to curl up with a book and some tea? Don’t mind if I do! Adorable! I love them!! Does the frame next to your bed say Bunny Baubles?!? So cute!